← Too rainy to BBQ ? Bake the salmon! I just don’t feel much like eating these days, don’t feel like cooking. There has just been too many good meals, too many “French” (5 courses) menus, way too many cookies, chocolates and other treats. It felt somehow expected and appropriate to serve all this during the holidays but now a healthier, simpler fare is back on the table. January being the month of good resolution, I am back to “la cuisine des familles”, mostly dishes that can be put together in half an hour or so and that require few ingredients. Last night was a treat! All ready on the table in 30 minutes. I skinned four large chicken thighs and started browning them on high in a Le Creuset cocotte with one clove garlic and 2 tbsp duck fat (olive oil is a good substitute). I turned them over and added a chopped onion, two sliced Yukon Gold potatoes, thyme and parsley, 2 leeks halved and a cup of white wine (left-over and kept in the fridge). I simmered that with a lid on for 25 minutes. There was just enough sauce at the bottom of the pot to moisten the chicken and the potatoes when I served. You could have also thrown in olives and mushrooms. The chicken thighs are better than breast meat as they remain very moist and tasty from cooking with the bone in. The white wine is just an option to finish open bottles, but chicken broth is just as good, or a mixture of water and lemon juice. 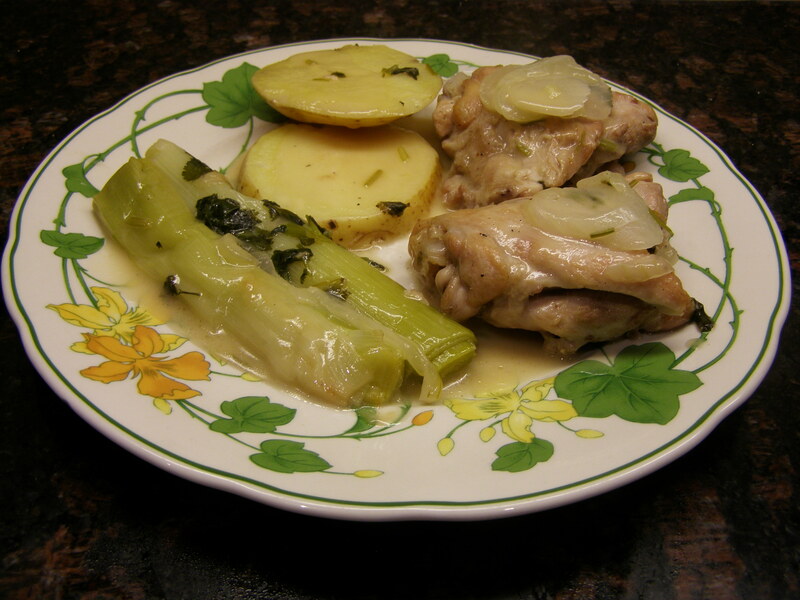 This entry was posted in Main Course and tagged Chicken thighs, leeks, quick dinner. Bookmark the permalink. this is my staple dish!